President of the Christian Association of Nigeria (CAN), Reverend Samson Ayokunle, has on Tuesday in Abuja signed a peace treaty promising to ensure peaceful atmosphere before, during and after the 2019 general elections. The treaty was signed by Prelate of Methodist Church, Reverend Samuel Uche on behalf of CAN President, alongside Sultan of Sokoto, Sa’ad Abubakar III, who was represented by the Emir of Keffi, Dr. Shehu Chindo-Yamusa. Thisday reports that the peace deal was signed at a Peace Declaration Summit organized by the Nigerian Interfaith Action Association (NIFAA) in collaboration with local and international partners. 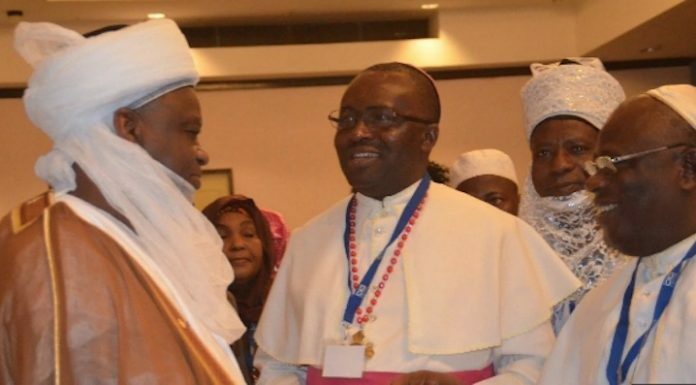 The summit was attended by leaders of various religious groups, youths, women organizations, traditional rulers and academicians from all over Nigeria. The leaders however enjoined Christians and Muslims to embrace dialogue and work together to avoid violence. “We join together to affirm that Nigeria is and shall remain a country committed to peace and harmony among all of its members, Christian or Muslims, from the north or from South. And that democracy must bring us closer together as a people and not separate us. “We join together in patriotic love for our country and our fellow Nigerians to declare for peace as key stakeholders representing various religious and ethnic groups in Nigeria,” they pledged. Both leaders expressed commitment to their pledges, adding that they embrace a vision of common humanity and ensure to demand free and fair democratic elections, conducted in peace for the benefit of all Nigerians regardless of ethnicity, religion or geographical zone.